On the Hero Arts blog this week, they are going over complementary colors from the color wheel. Monday's color was black and white. I have never tried anything like this before but thought I'd give it a shot. I actually had this card and the trimmings tossed on the side because I was planning to use it for something else but I decided to use this to make my card. 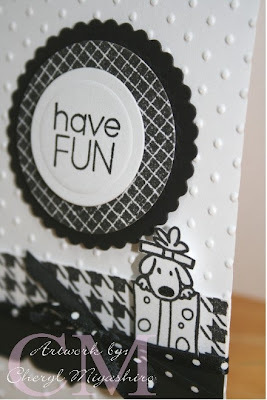 I used the screen shadow stamp for the circle, houndstooth stamp for the border, word stamp is from the Ink & Stamp party set and the cute little puppy in the present is from an older stamp set I saw at the store. This was actually fun and there was no coloring involved. Hero Arts screen shadow, houndstooth, Ink & stamp party set, puppy stamp, circle & circle scallop nesties, swiss dots folder, Fiskars upper crest punch, Offray ribbon and Stickles gg. Hope you're having a great humpday and thanks for stopping by today! Wow, Cheryl! This card is so striking!! It came out great! Love the B&W card. I also am loving that houndstooth stamp..so many tings to buy!! Oh Cheryl ... you totally read my mind b/c I have been wanting to make a b/w card after seeing a challenge a couple of weeks ago. LOVE IT! Love this blk. & white card!! It's so pretty with the embossing, and the ribbon.